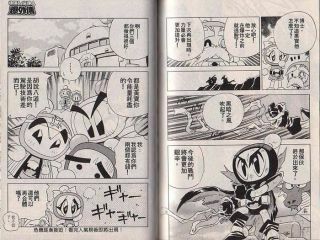 Japanese comics like this will soon be delivered by subscription to iPhones in the US. As if Apple's iPhone didn't already have enough geek appeal, a Japanese company has announced a deal to bring manga comics to the wonderphone later this year. At the Red Herring Japan 2007 conference held this week in Kyoto, telecoms software specialist Voice Bankdetailed a deal [PDF link] with the Digital Manga Association Japan ( DMAJ ) to format Japan's famous comic books specifically for the iPhone. Voice Bank has developed a converter that shrinks manga pages created for viewing on PC screens to iPhone size, claiming it made the move because the phone's touch-sensitive screen is perfect for the panel-based graphic medium. It is now looking for a distribution partner in the US. Cynics might say that Voice Bank is hoping to piggyback on Apple's success in the knowledge that anything connected to the iPhone will get extensive press coverage. We, on the other hand, prefer to remind readers that manga are actually pretty interesting artworks made for grown-ups, not kids. Incidentally, did you know that the chairman of the DMAJ is known as Monkey Punch ?